OUEHT’s 2Q18 DPU of 1.17 Scts (-3.3% y-o-y) was below expectations. Mandarin Orchard RevPAR was down 0.5% y-o-y, tracking below the increase in overall market RevPAR. FY18 a transition year but DPU recovery on the horizon on a multi-year recovery in the Singapore market. We reiterate our BUY call with a revised Target Price of S$0.90. While FY18 is a transition year for OUEHT given the loss of income support, OUEHT’s share price should rally as investor interest in OUEHT improves on the back of a multi-year recovery in the Singapore hospitality market and revenue per available room (RevPAR) at its key asset Mandarin Orchard Singapore trends towards the peak level of over S$250 from the current depressed S$220. OUEHT is also attractively valued, trading at a relatively high forward yield of 5.9%, with a 2-year DPU CAGR of 5%. Where we differ – P/B can expand further. While consensus has caught up to our view that OUEHT should trade at a premium to book with consensus’ Target Price implying a P/B of 1.1x, we believe with a multi-year recovery in the Singapore hospitality market, OUEHT should trade at a higher premium to book. We look back to the 2010-2011 period where its comparable CDL Hospitality Trust traded up to 1.5x P/B during an upswing in the Singapore hospitality market. Thus, OUEHT remains attractive at c.1.1x P/B and can trade up to1.2x P/B implied by our TP. With OUEHT’s distribution yield compressing over the past year from levels which we believe were unjustifiably too high in the first place, OUEHT is now in a strong position to pursue DPU accretive acquisitions. Beyond its Sponsor’s OUE Downtown serviced apartments, OUEHT is also seeking opportunities in Europe, the US and Japan. We have not incorporated any acquisitions in our estimates. Due to the weaker than expected 2Q18 results, we lowered our DCF-based Target Price to S$0.90 from S$0.93. OUEHT delivered 2Q18 DPU of 1.17 Scts (-3.3% y-o- y) resulting in 1H18 DPU of 2.43 Scts (-3.2% y-o-y). While we had expected 2Q18 DPU to be down largely due to the absence of income support this quarter (S$1.63m in 2Q17), the results were below expectations due to weaker than expected RevPAR performance. 2Q18 revenue per available room (RevPAR) for Mandarin Orchard Singapore (MOS) fell 0.5% y-o-y, underperforming the 4-5% increase in Singapore market’s RevPAR based on STB and STR Global data. Based on our discussions with management, we understand MOS underperformed the market mainly due to its traditional large exposure to Indonesian guests (c.30% of hotel guests). The combination of school and Lebaran holidays this year, meant that Indonesians were more inclined to go for long haul destinations such as Europe and the US rather than coming to Singapore. In addition, the weakening of the IDR versus SGD may have been a factor. We note that the strong RevPAR performance during June driven by the Trump-Kim summit appears to have benefited the hotels in the luxury category rather than upscale/luxury hotels such as MOS. Nevertheless, NPI contribution for MOS was flattish y-o-y. In contrast, OUEHT’s other hotel, Crown Plaza Changi Airport (CPCA), had a better quarter with 2Q18 RevPAR jumping 10.5% y-o-y to S$168. The property continues to ramp up after the opening of the second wing in late 2016. Earnings for the property was flattish given that only the minimal rent was received. We understand RevPAR for the property has to hit S$190-191 before OUEHT receives the variable rent on top of the minimum rent of S$22.5m per annum. Meanwhile, revenue and NPI for Mandarin Gallery remains under pressure, down 4.3% and 1.9% y-o-y respectively, due to the negative rental reversions over the past year despite effective occupancy improving to 97.4% versus 93.1% in 2Q17. On the positive note, 2Q18 was the second consecutive quarter whereby OUEHT was able to achieve positive rental reversions for Mandarin Gallery. For 2Q18, base rent for leases signed during the quarter were up 5.1%, stronger than the 2.2% increase in 1Q18. Post the renewal of leases in 2Q18, only 10% of leases by gross rent are due for expiry in 2H18, down from 13% at end 1Q18. We understand that the leases expiring in 2H18 are mainly related to units on levels 3 and 4. In FY19, around 14% of leases are due for renewal. Gearing and borrowings were steady at 38.7% and 2.3% respectively. The proportion of fixed rate debt was also maintained at 71%. OUEHT faces no refinancing until FY20. With no change in property valuations, NAV per unit stood at S$0.76. To better reflect the weaker than expected 2Q18 results, we moderated our RevPAR growth assumption for MOS from 4-6% to 2-5% p.a. over FY18-FY20. Consequently, we cut our FY18-20F DPU by 3-4% with our DCF-based Target Price dropping to S$0.90 from S$0.93. 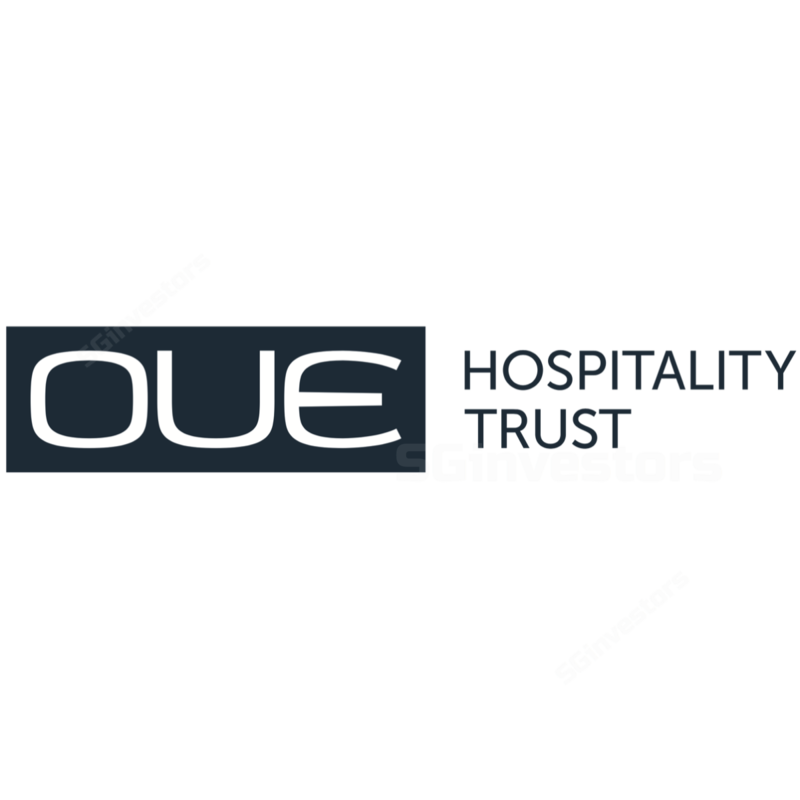 While FY18 is a transition year for OUEHT due to the absence of income support this year and 2Q18 results was below expectations, we believe RevPAR for OUEHT’s hotels are still on a recovery path, given limited new room supply over the next 3 years. This should translate to a healthy 5% CAGR in DPU over FY18-20. Thus, we maintain our BUY call with a revised Target Price of 0.90.